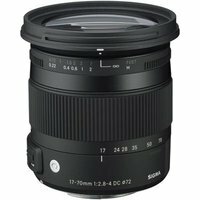 The Sigma 17-70mm f2.8-4 DC Macro OS HSM Lens Sigma Fit is an all-purpose, standard zoom lens specifically for digital SLR cameras with an APS-C sized sensor. The Sigma 17-70mm offers everything from sweeping landscapes to stunning portraits, while keeping the size of the lens compact and easily portable. The Hyper Sonic Motor (HSM) ensures quiet, accurate and fast autofocusing while the OS (Optical Stabiliser) compensates for camera shake when shooting by hand. The construction of the 17-70mm includes new TSC material (Thermally Stable Composite), which allows for increased durability as well a reduction in size by 30%. Two FLD glass elements, which have performance equal to fluorite, are incorporated with one SLD element to reduce colour aberration at the highest degree. The lens offers a large f/2.8 aperture at 17mm wide angle making it a great low-light performer.